SEO Training Courses can be a good choice as a follow-up to our Site Audit, Keyword Search, Backlink Checker reports. 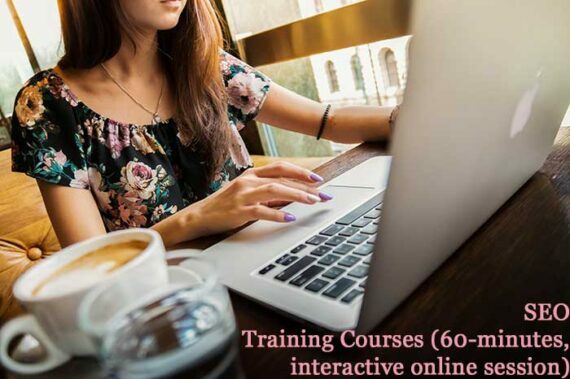 Our SEO Training Courses are also a frequent choice to upskill, learning new important notions in theory and/or how to practically implement some SEO Strategies to your own project or website. The sessions take place on one-to-one Skype live video calls, made with screen share. Please, add on your booking notes the date and time you’d prefer to book a session: we’ll come back to you confirming whether it is still available or listing the available other time slots. You have a technical background or you don’t: the SEO Training Courses are really for everyone who likes the topic! On average, people book several SEO Training Courses after getting to try the first one: contact us to request a coupon code for group lessons and/or for a program which includes multiple sessions! I have just had my first one hour on-line training session with Silvia. I found it extremely informative and plan to put into practice some of her recommendations over the week-end. I am very glad I booked for 2 sessions as 1 simply isn’t enough to cover it all. I would highly recommend contacting Silvia for any of your training needs, especially with regards to SEO. She delivered a live session on SEO Basics for Business Owners at the Petit Miracle Hub, a charitable business incubator supporting entrepreneurs from disadvantaged backgrounds. She helped attendees of the session understand the intricacies of SEO marketing, which many- until her session – found very confusing! The training was well structured, clear and informative. She received a lot of great feedback from the workshop participants with many wishing she would deliver another session in the near future! 100% recommend! Thanks a lot! I loved delivering the training to the group: they paid so much attention and asked such relevant questions! It was a real pleasure to talk about SEO for them!